Straight barbell curls are one of the most common weightlifting exercises out there, second only to maybe the bench press. If you’ve spent any amount of time in a gym, you’ve seen countless people using straight barbells to work there biceps. 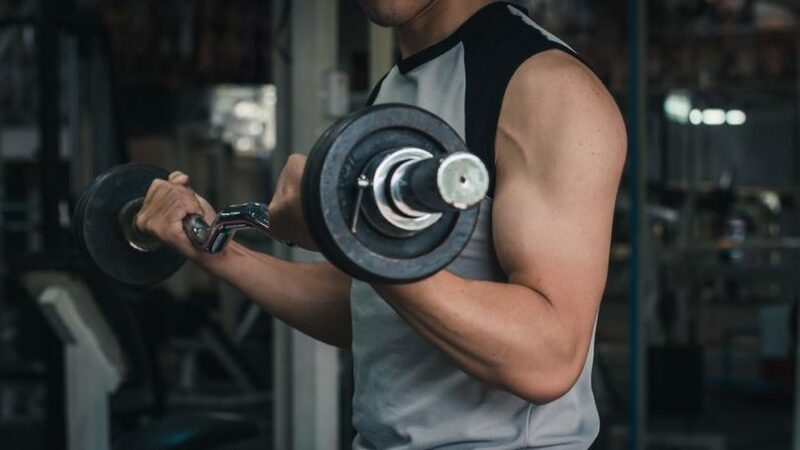 In fact, when you first walked into a gym, before you knew what you were even doing, you most likely gravitated straight to either doing barbell curls or giving the barbell bench press a go. Either way, you get the point; barbell curls are one of the most used exercises ever. There is, however, a huge problem with doing straight barbell curls. They’re great for developing the biceps but many people notice that their elbows and wrists take a beating with them. The hand/wrist position used when lifting the straight bar puts far too much strain on the delicate joints of the arm. Just like how a golfer might get golfer’s elbow. To get almost the exact same benefits from the exercise, you can instead use an EZ curl bar. Instead of being dead-straight, like the straight bar of course, the bar curves/dips in the middle where you grip the bar. This slight angle in the bar allows your wrists to twist inwards ever so slightly. This slight angle change prevents said wear-and-tear on your wrists and elbows whilst still stimulating the biceps muscle. Some experts say that you can even better work the brachialis portion of the arm with EZ curl bars. This bar weighs 14 pounds unloaded and can handle weights of up to 200 pounds. It’s unlikely that most trainers will ever need to EZ curl or skull-crusher more than 200 pounds so you’re covered on the weight front. The end of the bars are thick enough to comfortably accommodate 2” olympic style plates so you should be able to use most legit weight plates that you find online. Marcy have also included diamond knurled hand-grips so you have the ultimate grip when curling or pressing, which comes in especially handy when the bars have rotating sleeves like this one does. Like the EZ curl bar from Marcy, this bar from CAP Barbell can hold weights of up to 200 pounds without faltering. Where it differs, however, is that this bar is meant for use with smaller plates, particularly those with 1” holes. These smaller plates are the kind of plates that are far more common in home gyms and tend to be compatible with other home gym equipments. You can find both olympic plates and these smaller plates online easily but you’re most likely to already have the smaller ones if you already own other pieces of home gear. CAP Barbell have included some handy safety collars which spin around the threaded end to tighten themselves and hold the plates in place. Body-Solid offer this bar in two colours; standard chrome or black. Both look stunning and both won’t look out of place with other pieces of equipment like benches, etc. Both bars are identical except for the colour so it’s purely an aesthetic choice. This bar is an olympic bar, like the one from Titan Fitness, which means that it is 47” long and accommodates olympic plates with 2” holes in the middle. You’ll be able to find the appropriate weight plates and collars online very easily. Like most/all EZ curl bars, you have two main choices of grip; close grip and then a slightly wider grip. Which grip you use will depend on both your shape/height/size of your individual bodies and your specific needs, i.e what part of the bicep you wish to emphasise. As you may have guessed by now, there are two main types of EZ curl bars on the market; standard and olympic, which use 1” plates and 2” plates respectively. This bar is essentially the same as the other excellent bar from Body-Solid except that it holds smaller-holed plates. Now, choosing between these two models is simply down to personal preference/choice. If you already own weight plates, it’s probably best to buy whichever bar accommodates said plates that you already have. Both bars are the same length and there is barely any difference in the weights, a couple of pounds at most. Both bars are made with the utmost care and will be able to handle any use for a long period of time. With most EZ curl bars, and barbells in general, you will buy the bar separate to buying plates/collars. This can be a pain. Especially when you order both plates and the bar at the same time but then receive one before the other. You’ve got the bar sitting there but the weights don’t arrive for another week or so. Extremely annoying! XMark have rectified this mistake made by so many companies and offer many different purchasing options; you can buy the bar separately or you can buy it complete with weight plates of two different varieties. There are twelve weight packages in total, starting from 45 pounds and going up to a total of 115 pounds, so something to suit everyone’s needs. The bar and the weight plates are olympic plates so it might be a good idea to opt for the higher weight packages so you can use the plates with other bars and pieces of equipment. Bicep curls are a great exercise and it should have a firm place in everyones weight routine. Save your elbows and wrists from needless harm and opt for the much safer and much more ergonomic EZ curl bar.